While we don’t generally advocate fast food, we’re all about fast fitness. Exercises that burn the maximum amount of energy in the minimum amount of time are perfect for those of us who want to get in a workout, but don’t have ages to spend at the gym. If you’re one of the world’s many busy bees looking to get fit quickly, read on for 10 exercises that burn 200 calories in the time it takes to boil a kettle! You might be familiar with jumping jacks, a gym class classic that packs a serious punch, but prisoner jacks take this move up a notch. This move targets the quads and glutes, but its fast pace means you’ll also be revving your heart rate. Three minutes of these will work up a major sweat. The key to this exercise is staying low in your squat to fire u the lower body and while kicking up the cardio! Step 1: Stand with your feet close together, hands behind your head, and lower down into a narrow squat so that your weight shifts back to your heels. Step 2: Staying low, but with your chest up, push off your heels and jump your feet wide, landing in a wide squat position. Jump back to the start position. Continue jumping your feet out and in with a squat as fast as you can. If you’re looking to work your core in minutes, this move is the one for you. Targeting your entire middle as well as your hip flexors, this move not only boosts your cardio fitness and core strength, but also works on your finesse, making it perfect for lovers of yoga and pilates. Step 1: Begin in your high plank, shoulders over wrists and pressing back through the heels. Pull one leg up into a runner's lunge, getting the foot as close to the outside of your same-side hand as you can. Keep the hips down. Flexibility will determine your range of motion here, so keep working on it! Step 2: Step the leg back into your high plank and repeat the runner's lunge on the other side. Step 3: Return to your high plank again, then use the core to jump both feet to the hands. Drop the hips down into a deep, frog-like squat, letting the knees fall out to the sides. Jump the legs back to your high plank to complete the repetition. Two of the most common areas that women feel self-conscious about are their stomachs and the backs of their thighs. Thankfully, three minutes of this move will have those areas feeling tighter and more toned. The squatting nature of this position works your glutes, and the power for the explosive jump comes from your abdominals, making this move a real multitasker. Step 1: Begin in a squatting position with your feet outside the shoulders and the hips dropped backward and down. Make sure your knees stay behind the toes. Reach down to the floor with the hands, but keep the chest lifted. Step 2: Explode out of the low squat position by pushing through the legs and throwing your hips forward. This will allow your body to travel forward. Land with soft knees or in a deep squat to repeat the move. If you love dance-inspired workouts but don’t have time to catch a Zumba class, get your groove on with this move. Combining jumps with abdominal twists, this move is perfect for those of you who love to shake your hips. Step 1: Stand tall with your feet together and knees slightly bent. Bend your elbows and clench your fists, holding them in front of your body. Step 2: Hop into the air and twist your legs and hips to the right while keeping your torso facing forward, landing with your feet together and knees bent. Step 3: Immediately jump into the air, twisting your legs and hips all the way to the left. Continue twisting your lower body from left to right repeatedly for the instructed amount of time. There’s a lot to be said for exercising outside; you get a little fresh air and sunshine and have much more freedom to move than you do in a gym or at home. 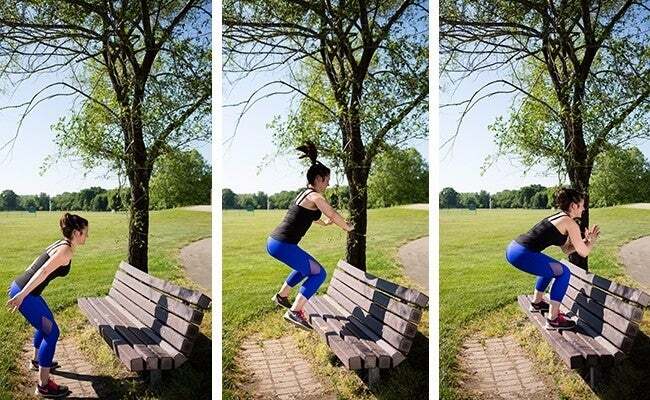 If, however, your time outside is limited, make the most of it with these bench jumps. They work the whole lower body, including the glutes, quads, and hamstrings — and trust us when we say that three minutes of these is more than enough to leave you feeling invigorated. Step 1: Stand in front of the bench, about 1 foot back so that your knees and shins do not make contact with the bench on the way up. your feet should be shoulder-width apart and the knees, bent. Step 2: Using your core and arms, pull yourself up first then over to land on the bench. The knees are soft so your muscles absorb the shock of the landing instead of your joints. Get your entire foot on the bench, not just the ball of your foot. Step 3: Land in a half squat on top of the bench. Stand up and safely step one foot down at a time. Repeat the jump. Note: Do not jump backward off of the bench as it could cause serious injury to the Achillês or knees. » Want more mores you can do outside? Check out our Ultimate Playground Workout! Burpees are an incredibly effective exercise on their own, but adding gliders to the mix really amplifies the exercise’s core strengthening. If you don’t have gliders, even paper plates will do. Step 1: Stand tall with each foot on top of a glider. Your feet should be under your hips. Step 2: Lower the body down until your hands are on the floor on the outside of your legs. Step 3: Slide the feet behind you until you get into a high plank position. Shoulders are over the wrists, hips are locked into place (no sagging or piking) and feet are still hip-width or about 6 to 8 inches apart. Step 4: While you're there, drop into your pushup! Fitness model, Jean Sherfick shows a tricep pushup here, but you can perform a traditional pushup with the elbowspointing at a 45-degree angle behind you, or drop to your knees. Just keep your feet on the floor and on top of the gliders. Step 5: Exhale and push yourself out of the pushup, returning to your plank. Inhale here. Step 6: Exhale again as you slide the knees back under you until your feet are completely under your hips again. Step 7: Use the power of your squatted position to explode upward into a vertical jump or stand and raise your arms overhead. Be sure to land directly back on the gliders to perform the next rep. If there’s one move to try off this list, it’s this one. Switch kicks work the whole body and really get your heart pumping. On those days when you’re not feeling motivated to work out, remind yourself that with this move, you don’t even have to stand up and you still get a great workout. Step 1: Sit with your knees bent, feet flat on floor, palms behind you and your fingertips pointed toward your heels. Keeping hands and feet planted, raise your hips off the floor and alternate, kicking left leg and right leg as high and as fast as you can. Step 2: A kick with your right leg and a kick with your left leg counts as one rep. Continue to alternate legs for allotted time. Another total body move, the four corner box jump is great if you have a bit more space to work out. Jumping in a square might sound easy, but after three minutes of this you’ll be sweaty and spent! Step 1: Place two strips of tape on the floor in the shape of a large plus sign, so there are four quadrants. Step 2: Start in one quadrant and lower into a squat position with your feet together, knees behind toes and chest up. Step 3: Jump from one quadrant to the next, landing in a squat each time; move as quickly as possible to get your heart rate up. Once you’ve hit all 4 quadrants, that is one rep. If you participated in high school sports, chances are this move popped up once or twice in your training, and with good reason. It’s a great way to work both your cardiovascular fitness as well as your calves, glutes and core. Step 1: Stand tall with your core pulled in and your shoulders back. Places your hands out at hip height to help gauge your performance. Keep this posture and raise one knee up to the hips or higher, keeping the other leg bent and ready to follow. Quickly alternate knees, leaning back with a strong core to help drive them toward the chest. Repeat for allotted time. We’ve all admired the grace and finesse of figure skaters. Now thanks to this move you too can get their long, lean muscles. With just three minutes, you can burn 200 calories, so now there’s no excuse to skip a workout! Try these moves the next time you’re crunched for time. Step 1: Start with your legs slightly wider than shoulder-width apart and arms at your sides. Step 2: Bring one leg behind your other and tap that foot to the outside of your stabilizing leg. Step 3: Swing the arms in front of that bent knee and leap the back leg to starting position while simultaneously bringing the front leg behind in a skating motion. That is one rep. Arms alternate as you switch sides like a speed skater.